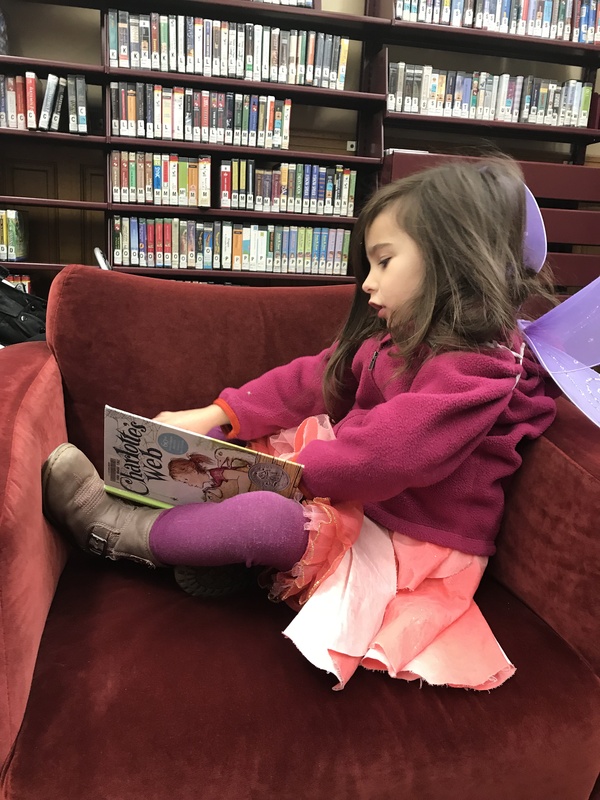 I wanted to share this moment from today: while we were trick-or-treating at the library today I lost sight of Luella (truth be told, I was in line to get the ‘good’ candy) & when I found her, she was enthusiastically trying to read Charlotte’s Web & introduce characters to her friends. It was very sweet- and we sat there for a while, while she looked through it. Thank you for introducing her to this book. This entry was posted in books, chapter reading, E.B. White, Early Education, Expressing words and feelings, Giving thanks, preschool, reading, reading aloud, Teaching young children and tagged Chapter reading books, Charlotte's Web, Halloween at the library, literacy, teaching young children. Bookmark the permalink. A lovely validation you are doing the right things, Jennie. That must feel good, Jennie – well deserved! It does, Dan. And unexpected, as she rarely said much during chapter reading. You never know what is percolating in those wonderful little brains. So sweet! That child will read that story to her children, and her children will read it to their children down through the centuries. I’m so glad you enjoyed it. You must get surprise emails from students, too. Not only great to see the little girl affected by your love for books, but a pleasure to read that the parent took time to acknowledge that too. Thank you, Pete. Both were equally important. How very special. So pleased you shared it. It is a validation that reading to children has an effect. Also great to see that a parent took the time to let you know. Yes, and yes! Thank you, Darlene! Fantastic, Jennie, what a great way to end the week. Thank you, Robbie. You are so right. This is great. With her desire to share her love of books, she may become a teacher, too, someday. Kudos to both you and her mom! Wouldn’t that be wonderful! Thank you, Marcia. What an adorable story! I’m so glad you shared it and gave me this smile, Jennie. Great big hug! How folk tales and traditional life snuck into avant-garde kids’ books in the 1930s. From Moscow to Bukhara borrowed from the avant-garde but showed daily life. Natalia Chelpanova was 20 years old in 1917, when the Russian Revolution transformed her country. As an art student, she became part of the new VKhUTEMAS (Vysshie khudozhestvenno-tekhnicheskie masterskie, or Higher state artistic and technical studios)—the state school also known as the “Soviet Bauhaus.” There, she studied under avant-garde artists steeped in ideas about abstract art and the role of art in social movements. When she started to illustrate children’s books, she used all the hallmarks of the school—simple geometric shapes, cutouts, collages, simplified palettes. In her 1932 Baba-Yaga, the forest is made of simplified pine trees in blue and black, which seem to pop from the page. The cover features six girls wearing headscarves and aprons in red, white, and brown, and forming a simple circle. When Christine Jacobson, the assistant curator of modern books and manuscripts at Harvard’s Houghton Library, saw the cover, it surprised her. “It’s a very avant-garde cover,” she says. In the 1920s and 1930s, a golden age of Soviet children’s literature, that wasn’t uncommon: Some of the most cutting-edge art could be found in children’s books. But this book told a classic Russian folktale, in which a young girl encounters the witchy Baba Yaga and her walking house. That should have been off-limits. “You have anthropomorphic flora and fauna, magic, evil step-mothers—you have all these things you’re not supposed to have in Soviet children’s work,” Jacobson says. The cover of Baba-Yaga by Nathalie Parain, née Chelpanova. Most often, the story told about early Soviet kids’ books focuses on their political aims, as propaganda that aimed to inculcate young minds with revolutionary ideas. But part of Jacobson’s job is to help expand the library’s collection with an eye to preserving and elevating works that might have been overlooked because they weren’t made by Western Europeans, or by men. She recently acquired Baba-Yaga, as well as another unusual work from Soviet children’s literature, From Moscow to Bukhara. These books, which marry older threads of Russian culture with Soviet and avant-garde ideas, don’t exactly fit the dominant narrative about Soviet kids’ books. But preserving the work of the perhaps overlooked women behind these books adds new color and depth to the idea that Soviet children’s book were a perfect marriage of propaganda and art. Parain’s Baba-Yaga was influenced by avant garde art and traditional folk tales. In the early years of the Soviet Union, authors and illustrators invigorated by the revolutionary spirit reimagined children’s literature, and set to work at the centuries-old task of shaping young minds through simple stories and vivid pictures. In one iconic poster, Lenin has his arms outstretched, imploring the country to “Give Us the New Children’s Book.” Baba Yaga, demons, kings, and queens were out, and planes, parades, and farming were in. These new children’s books leaned on abstract, avant-garde images and are easily identified—just like the iconic Soviet posters—as the products of a particular place, time, and ideology. Although the revolution created new opportunities for women, children’s books were still written and illustrated mostly by men. In a short period of time, artists and authors—most famously, the team of Vladimir Lebedev and Samuil Marshak—carved out a space for creativity and innovation, during a time of “uneasy equilibrium of politics and art,” as Sara Pankenier Weld, a Slavic literature scholar at the University of California, Santa Barbara, writes in her work on Russian avant-garde picture-books. But this was only a brief window, before the pressure of propaganda took over. “Any women who joined avant-garde children’s book illustration after it had been established … would have had little time to make a unique contribution before this window closed,” writes Weld. Marshak and Lebedev were a storied team, and Yesterday and Today was one of their most famous books. But the books that the Houghton Library uncovered reveal other cul-de-sacs in the story of Soviet children’s books. Chelpanova married a French philosopher and became Nathalie Parain. She moved to France, where she socialized with some of the time’s most influential avant-garde Russian artists. Because her work was published in Paris, she would have been freer than artists back home to choose her subjects. Like other Russian illustrators, she chose avant-garde images to match with her stories. But she ignored Lenin’s dictum and applied that aesthetic to a classic tale, hinting at how the nation’s past might connect to its present. The author of From Moscow to Bukhara, Aleksandra Petrova had a different story. “She’s not of the avant-garde. She’s of the approved artist milieu of the time,” says Jacobson. Petrova was hired to paint murals in a Moscow subway station, for instance, which she executed in the style of Soviet realism. The cover of From Moscow to Bukhara. But in her children’s book, Petrova took a leap. She borrowed from avant-garde artists in her illustrations, using limited colors and bold, simplified figures. But in her choice of topics she, too, drifted from the rules of the new Soviet children’s books. Most avant-garde children’s books showed figures against blank space: The future hadn’t been filled in yet. And many of the books avoided showing scenes of daily life, since reality didn’t always stack up to the perfect world promised by communist ideology. But Petrova took a risk and showed scenes of traditional Uzbek life to show how Soviet influence had transformed it. Her illustrations depict schools, trains, and a mosque with a “museum” sign on it, and although it’s not overtly anti-revolutionary, the book reveals the ways in which the Soviet Union still treated parts of its domain with a colonial instinct. “The more you dig into Soviet children’s literature the more you find outliers doing really interesting things and breaking the rules,” Jacobson says. Often, Soviet Russia is understood as a monolith, with the state controlling all human endeavor. There’s truth to that view. It wasn’t long before even Marshak and Lebedev, one of the most celebrated teams in this realm, came under pressure to rein in their most bold and creative impulses. But history and people are complicated. And that’s part of a library’s job—to find and save cultural treasures that can help tell a fuller story of how people thought and expressed themselves in the past. Thought you might enjoy this one, Jennie. I remember Baba Yaga from my growing up. This is so interesting, Anne. I am not surprised at how the artist and her avant-garde talent developed. I have dusty memories of Baba Yaga. Thank you! Beautiful! We learn so many life lessons early on. We definitely do. Thanks so much, Marie! Another reader created with love. Does warm the heart, doesn’t it? 🙂 The fact that the parent noticed says a lot as well. Yes, indeed, Marlene. A warm heart for sure. I do believe she’ll be a reader. And the parent noticing- that’s wonderful. She emailed me tonight asking how I read aloud so that the children who don’t come every day don’t miss things. Good question (yes I do that), and a parent who values reading. That’s a lovely letter and a wonderful photograph sure to be a treasured one too! Thank you, Deborah. It is, indeed.